First there was God of War, then Sly, now it appears two more franchises are taking their PlayStation 2 entries and tarting them up for a release on the PlayStation 3. 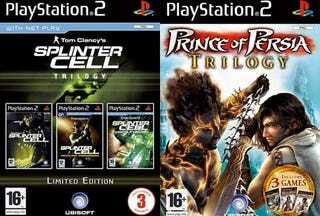 Amazon France has listings for trilogy boxsets for both Splinter Cell and Prince of Persia, saying that both are set to appear on Sony's high definition console. This makes a whole lot of sense, since Ubisoft released trilogy boxsets for Prince of Persia and Splinter Cell on the PS2, which would surely be the games now bound for the HD treatment.